Yes seldom do anything in a small way when it can be done in an epic manner. So, it shouldn’t be surprising that this documentary is over it has lasted three and a half hours. Of course, when you consider that it covers a span of time leading up to the formation of the group and running to 2007, that isn’t such an outrageous amount of time. Virtually any person who was ever involved in the band gets face time in terms of new interviews with the notable exceptions of Tony Kaye and Patrick Moraz. It is really an amazing documentary, and certainly the most comprehensive one out there. The second disc includes extras like extended interviews and longer clips of footage used in the first disc. 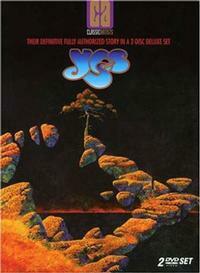 Anyone with an interest in progressive rock in general, and particularly Yes fans, should definitely get this DVD. This review is available in book format (hardcover and paperback) in Music Street Journal: 2011 Volume 1 at lulu.com/strangesound.